We have to hand it to the Social Media wonks over on Yawkey Way (hey, maybe it's been Jean Yawkey Way all along...hmmm, something to think about! ), they sure know how to poke a finger into the giant's eye. 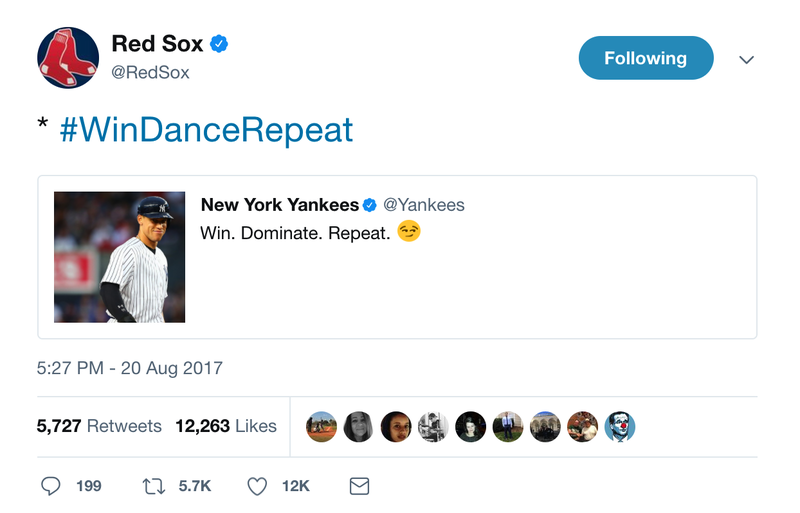 An official team TWITTER post from last night has the signature "#WinDanceRepeat" hashtag in response to the earlier ham-handed Yankee post of "Win. Dominate. Repeat." posted after a win by The Evil Ones earlier this season (June 8th). Ironically, the 'poster boy' for the earlier post is Aaron Judge—who is hitting a "robust" .155 against Boston this season.